The Clinkscales Family: Breathing Tube is OUT!!! Hip...Hip...Hooray! Cain no longer has a breathing tube. I think Cain told the Dr's and nurses when HE was ready to have it removed. He was getting pretty feisty and started reaching/pulling on the ventilator tube. He seems to be calmer now that they have removed the tube. He is still receiving a small amount of oxygen through a nasal canula. No breathing tube!! Some of his skin came off when they removed tape earlier. That's why he has that lovely spot on his cheek. Poor little guy. "And look...I was even opening my eyes." You think Daddy will be teaching Cain to give Mommy bunny ears in pictures? 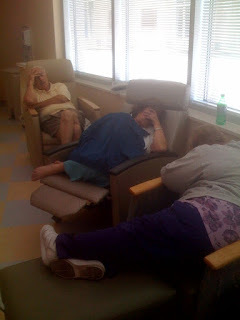 The Grandparents resting while we were waiting for Cain's breathing tube to be removed. Praise God he is doing so well! He really looks good! We will continue to keep you in our prayers - still got a ways to go! Conner and David(lil' bro) have been cheering him on! ET tube out....pacifier in! A good sign. I know mom and dad are excited! praise GOD!!! glad to hear he is doing well. Cain's life is such a testament to how good God is!!! WE love you CAIN!!! What an amazing recovery Cain is making! He is such a strong little guy!!! We pray he continues to make a quick recovery.